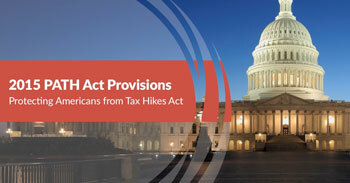 On December 18, 2015, President Obama signed into law the Protecting Americans from Tax Hikes Act of 2015 or PATH Act, which will go into effect mid February (60 days after signing). Notable are the amendments to US tax laws affecting non-US persons holding interests in US real property. Commonly referred to as the FIRPTA tax (Foreign Investment in Real Property Tax Act of 1980), non-US persons are subject to US income taxation on capital gains arising from the disposition of US real property (including, for example, a lease, an option or an interest in US real property other than solely as a creditor). As a mechanism to ensure that the US Treasury Department collects tax revenues from non-US persons selling US real property, FIRPTA generally required the buyer of the subject US real property to withhold 10 percent of the purchase price and furnish this amount to the IRS as tax withheld. Accordingly, as a general matter, a non-US person who sold US real property historically received not more than 90 percent of the purchase price. The residual amount of the purchase price could be refunded upon the non-US person`s filing of a US tax return. If you have questions about this or other tax issues, do contact us for assistance.